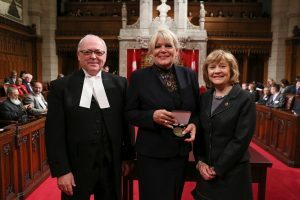 Johanne Savard, Montreal Ombudsman, was honoured during the 150th Anniversary Medals Ceremony of the Senate of Canada which took place November 19th, 2017. The Senate 150th Anniversary Medals were being awarded to Canadians or permanent residents actively involved in their communities who, through generosity, dedication, volunteerism and hard work, make their hometowns, communities, regions, provinces or territories a better place to live. The Medal also commemorates the first time Senators came to Ottawa to sit in Parliament, on November 6, 1867. Johanne Savard has been the Montreal Ombudsman for 14 years. She is currently the President of the Forum of Canadian Ombudsman, which has approximately 450 members. She is also a representative for the Americas on the Board of Directors of l’Association des ombudsmans et médiateurs de la Francophonie (an association of mediators and ombudsmen from 25 francophone countries).